He’s still the most recognizable man on earth. And nearly fifty years after he burst onto the scene as a gold-medal winner at the 1960 Rome Olympics, Muhammad Ali remains a magical figure, known and loved throughout the world. Dubbed “Athlete of the Century” by USA Today and GQ magazine, Muhammad continues to receive accolades for his contribution to sports. He has been named Sports Illustrated’s “Sportsman of the Century,” the BBC’s “Sports Personality of the Century,” the World Sports Award’s “World Sportsman of the Century,” and the State of Kentucky’s “Kentuckian of the Century.” In November 2005, he received the United States of America’s highest civil award, the Presidential Medal of Freedom. As a boxer, Muhammad brought unprecedented speed and grace to his sport, while his charm and wit changed forever what the public expected a champion to be. His accomplishments in the ring are the stuff of legend – two fights with Sonny Liston, where he proclaimed himself “The Greatest” and proved he was; three epic wars with Joe Frazier; the stunning victory over George Foreman in the Rumble in the Jungle; and dethroning Leon Spinks to become heavyweight champion for an unprecedented third time. But there was always far more to Muhammad than what took place in a boxing ring. Muhammad’s life and career have been played out as much on the front pages of newspapers as on the inside sports pages. His early embrace of Islam and his insistence on being called Muhammad Ali instead of his “slave name,” Cassius Clay, heralded a new era in black pride. His refusal to be inducted into the United States Army anticipated the growing antiwar movement of the 1960’s. His willingness to stage his much-promoted and publicized fights in such far-flung locales as Kinshasa, Manila, and Kuala Lumpur signaled a shift from superpower dominance toward a growing awareness of the developing world. Today, championing the causes of the developing world has become a major focus of Muhammad’s life. He has been instrumental in providing over 232 million meals to the world’s hungry. Traveling across continents, he has hand-delivered food and medical supplies to children in Cote D’Ivoire, Indonesia, Mexico, and Morocco among other countries. In addition to his international efforts, Muhammad is equally devoted to helping charities at home. He has visited countless numbers of soup kitchens and hospitals, and helped such organizations as the Make-A-Wish-Foundation and the Special Olympics. He annually participates in “Fight Night,” which generates funds for the Muhammad Ali Parkinson Research Center at Barrow Neurological Institute, in Phoenix, Arizona. At the State Capitol in Michigan, he advocated new laws for protecting children. He is also the namesake of the Muhammad Ali Boxing Reform Act (sponsored by Senator John McCain), a law that regulates professional boxing to protect boxers from unscrupulous promoters and poor health and bout conditions. In recent years, Muhammad has testified before the United States Congress several times regarding boxing reform. For his humanitarian efforts, Muhammad has been the recipient of countless awards. In addition to being honored by Amnesty International with their Lifetime Achievement Award, the Secretary-General of the United Nations bestowed upon him the citation of United Nations Messenger of Peace. In 2007, Muhammad received an honorary Doctor of Humanities from Princeton University. He was also named a “Living Legend” by the Economic Community of West African States (ECOWAS). Ever the entertainer, Muhammad has appeared in several motion pictures, including the big-screen adaptation of his first autobiography, The Greatest, playing himself. His life has been the subject of numerous films, including the Academy Award-winning documentary When We Were Kings and Michael Mann’s biopic, ALI, starring Will Smith. Muhammad also starred in Freedom Road, and made guest appearances on numerous popular television series ranging from Diff’rent Strokes to Touched by an Angel. He also starred on Broadway in the musical, Big Time Buck White, and recorded a popular album, I Am the Greatest! Muhammad published a memoir in 2004 entitled, The Soul of a Butterfly: Reflections on Life’s Journey, in which he discusses the meaning of religion, forgiveness, and some of the defining moments in his life and career. He is also the co-author of Healing: A Journal of Tolerance and Understanding and The Greatest: My Own Story. 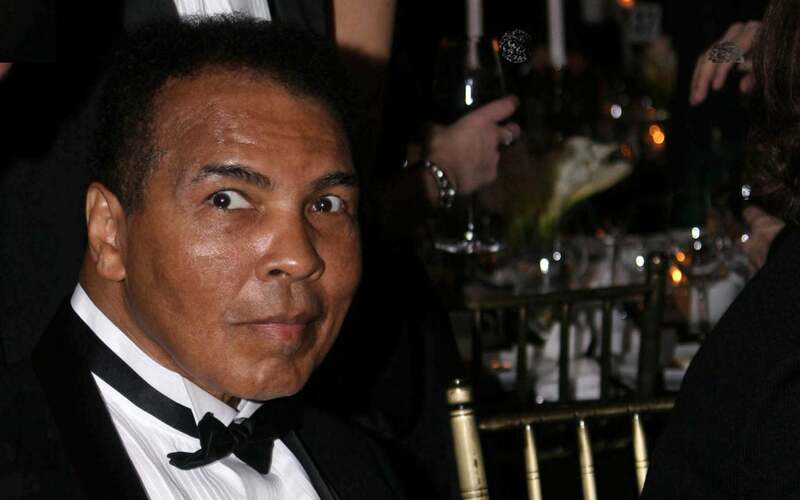 In 2005, Muhammad opened the Muhammad Ali Center in his hometown of Louisville, Kentucky. In addition to displaying a selection of his memorabilia, the Center’s exhibits focus on themes of peace, social responsibility, respect and personal growth. In 2006, he partnered with CKX, Inc. to form Muhammad Ali Enterprises LLC, for the licensing of his name, image and likeness and to continue promoting his cultural and philosophical legacy throughout the world. Muhammad has nine children: Maryum, Rasheda, Jamillah, Hana, Laila, Khaliah, Miya, Muhammad Junior, and Asaad. He is married to the former Lonnie Williams of Louisville, whom he has known since her family moved across the street from the Clay family when she was 6 years old.